Great parties, get-togethers, and memorable quality time wouldn't be possible without furniture you love. 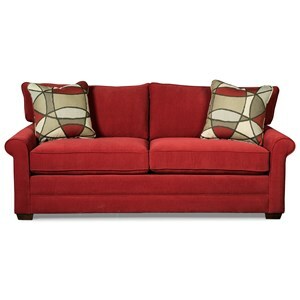 Its easy to love this cozy and casual sleeper sofa, with clean and timeless lines and plush, bed pillow-style back cushions. 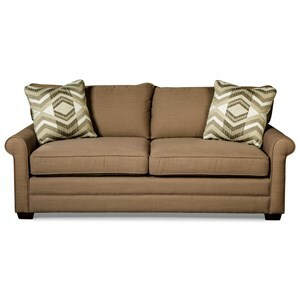 Make this sofa last longer by choosing a stain-resistant and durable performance fabric for your upholstery. See store for pricing and availability. The 7678 Casual Queen Sleeper with Rolled Arms and Innerspring Mattress by Craftmaster at VanDrie Home Furnishings in the Cadillac, Traverse City, Big Rapids, Houghton Lake and Northern Michigan area. Product availability may vary. Contact us for the most current availability on this product. Padding & Ergonomics The cushion consists of a 2.0 density foam core with a dacron fiber wrap. Pull-Out Mattress Standard, Innerspring Mattress. Memory Foam Mattress Upgrade Also Available. When your furniture is comfortable and reliable, there are less hassles keeping you apart from enjoying quality time with your family. Durable frames and designer-quality tailoring set this sofa apart from the lookalikes, creating a sofa that's a pleasure to live with. For families that need extra space to entertain guests overnight, you can convert any room into an instant guest room with three sizes of sleeper sofa. Then you can choose to upgrade your Full, Twin, or Queen sleeper bed to a Memory Foam mattress for frequent or hard-to-please guests. The 7678 collection is a great option if you are looking for Casual furniture in the Cadillac, Traverse City, Big Rapids, Houghton Lake and Northern Michigan area. 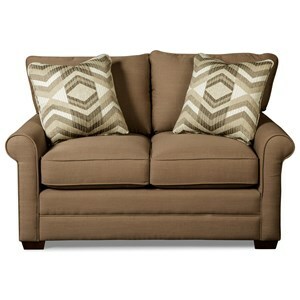 Browse other items in the 7678 collection from VanDrie Home Furnishings in the Cadillac, Traverse City, Big Rapids, Houghton Lake and Northern Michigan area.